Biometric authentication has been billed as the technology that may eventually replace passwords. But the C-suite, security professionals and rank-and-file employees all harbor different concerns about how biometrics are collected, stored and used. 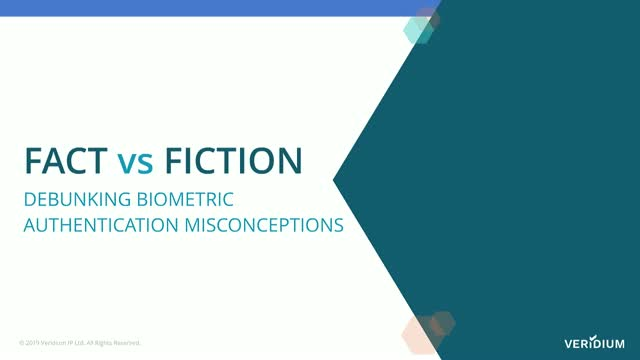 In this webinar, Asem Othman, Biometric Science Team Lead, at Veridium, and Professor Stephanie Schuckers, who serves as the Director of the Center for Identification Technology Research at Clarkson University, will explore some of the common misconceptions around biometric authentication and separate fact from fiction. Payment processors are determining how they can meet PSD2's requirements for strong customer authentication in a way that offers a hassle-free experience for customers. Webinar presented by Craig Hinchliffe, Principal Product Manager at Citrix, and Ross Penny, Global Head of Systems Engineering at Veridium. Citrix transforms work by delivering solutions for collaboration and virtual desktops which increase employee productivity by providing access to documents, information, and applications. Yet one of the major hindrances to employee productivity is the time wasted resetting passwords both for the employee and IT staff. Passwords have traditionally been considered a necessary evil to ensure security. But no more. Now there is a way to securely access Citrix environments (including ShareFile, NetScaler, XenApp, XenDesktop, Citrix Workspace) and integrate with Microsoft Active Directory without cumbersome passwords. Veridium – a Citrix Ready partner delivers stronger security with biometrics for multi-factor authentication (MFA) with single step convenience. This allows employees quick, convenient and secure access. Multi-factor authentication is imperative to any enterprise identity strategy to reduce risk. Please join us for a webinar that will demonstrate how you can improve the user experience and avoid the leading cause of breaches – password compromise - by eliminating passwords for Citrix workspaces across multiple environments. Financial services have always done identity management. It began as the teller or manager knowing each customer. Next came signature matching, passbooks, and – if you had a lock box in a vault – a key. These systems were inflexible and inconvenient on purpose. With the advent of the computer age, these organizations simply adopted the digital analogs of these physical systems: PINs and passwords. These increased flexibility – a customer or employee could access an account at any time from practically anywhere – but sacrificed security for the sake of convenience. To be secure, PINs and passwords need to be long, complex, and changed regularly: Three things customers have no interest in. Today, identity management is undergoing a revolutionary change as biometrics allow companies to combine the convenience people want with the security that both people and organizations need. Learn how three financial services companies from across the world, a private investment firm, a prominent Swiss bank, and a major trading organization, have deployed a biometric authentication platform as part of their identity and access management strategy. Veridium’s Chief Product Officer, John Spencer, will explore the key factors that make up a secure biometric authentication platform, and Global Head of Sales Engineering, Ross Penny, will discuss the details of deploying within different environments. • Using enterprise-ready solutions to replace passwords with multi-factor biometric authentication – including 4 Fingers TouchlessID, face recognition, and touch recognition – for employee and customer access. • Maintaining a highly secure-yet-convenient user experience across any channel: ATM, app, and personal computer. • Providing users with fast, easy, and seamless enrollment and verification. In today’s digital landscape, we don’t own our digital identities. We might be able to control what information we put online, and manage how it’s used to a degree, but once we give that data to Facebook, Google, or Microsoft, they own it. The emerging technology of blockchain has the potential to change that with the concept of self-sovereign identity (SSID). With SSID, individuals could maintain control over their digital identities, as well as how it is used and where it is stored. This would benefit businesses and consumers alike, simplifying efforts like KYC that cost financial institutions millions of dollars a year, and preventing data theft or misuse like the current Facebook/Cambridge Analytica fiasco. In this webinar, a leading blockchain researcher, Prabath Siriwardena, explores the evolution of identity management in the era of blockchain, introducing the idea of Bring Your Own Identity (BYOID) and self-sovereign identity, and the need for strong authentication using biometrics as part of this innovation. Prabath has over 10 years of experience in identity and access management and is currently leading WSO2’s research into bringing blockchain and federated identity together to better protect user privacy. The use of biometrics for identification and authentication is driving significant advances in security, but as more organizations deploy biometric systems, privacy concerns are also rising. This is particularly true with regard to facial recognition, which has a high opportunity for abuse. In fact, improving the accuracy of biometric systems increases the opportunities for misuse. New algorithms can let hackers extract non-identifying data, such as personal health details, from biometrics. This data could also be used to identify an individual outside of the scope of the original system, such as matching their enrolled facial image to their social media profiles. These types of abuse are particularly problematic if these systems aren't also protected from cross-linking – where the data from two different systems is compared to identify an individual enrolled on both without their consent. An example of this would be cross-matching a banking customer with their health insurance account using biometrics they’ve enrolled on both. If your organization is contemplating using biometrics, watch this webinar to learn best practices for protecting people’s privacy and their biometrics. One of the world’s leading biometric scientists, Professor Arun Ross, will explore the importance of protecting biometric data, examples of how it can be abused, and systems for improving privacy. Innovations in mobile devices are helping financial institutions to bank the under- and unbanked across the globe. Leveraging mobile technology, as well as blockchain and other more recent innovations, companies like Wala and Veridium are looking to bring banking services to the under- and unbanked in Sub-Saharan Africa. Will the GDPR regulation affect your business, but you don't fully understand what these new rules mean? This webinar takes a look at the realities of GDPR from a business perspective. What is GDPR, what it will mean to be compliant, and what can you do to prepare for it? We explain how you can achieve compliance, and how biometric authentication fits into the picture. Did you know that nearly half of the calls to company help desks are for resetting employee passwords? It's a staggering amount of time, money, and productivity wasted on a single task. How would you like a solution that eliminates passwords for identity management access and uses biometrics instead? Biometrics is one of the hottest topics in technology and cybersecurity markets today. The use of biometrics to enable user authentication and identity assurance is an essential improvement over usernames and passwords, and innovations in mobile devices, wearables, and other technologies is helping bring biometrics to mainstream audiences. As the new year approaches, it’s an opportune time to take a look at how innovations in related technology are going to impact biometrics, and how different markets, including healthcare and financial services, could be deploying biometric authentication in 2017. In 2015, 63 percent of all confirmed data breaches were the result of weak, default, or stolen passwords. In fact, this was the second primary cause of all data breaches, globally, according to the 2016 Verizon Data Breach Investigations Report. The death of passwords has been heralded for over a decade now, but these reports were often greatly exaggerated. However, in recent years this has begun to change, as new technologies are allowing companies to change how they secure access to digital assets. From traditional usernames and passwords to two-factor authentication, outdated security practices are failing to keep data secure. Whether it’s a lack of user adoption or actual flaws in the security infrastructure, businesses need a better option to protect access to their most important resources. In this webinar, we discuss the prevalence of data breaches today and where passwords and two-factor authentication fall short, followed by how biometrics, when properly deployed through end-to-end solutions like VeridiumID, can provide the missing piece for fully securing digital access. Fingerprints are an easily accessible biometric on most newer mobile devices. Thanks to Apple, millions of people are using Touch ID. As the field of mobile biometrics advances, new methods are being introducing beyond Touch ID, like finger-photo recognition for contactless fingerprint capture. High-quality rear-facing cameras make it possible to capture your fingerprints visually, without any additional hardware. This method increases overall security because it is extremely hard to spoof. In this webinar, we discuss 4 Fingers TouchlessID and analysis of the science behind it, as well as some of the real-world applications and benefits for biometric authentication. Veridium is a leader in single-step multi-factor biometric authentication, designed to safeguard enterprises’ most critical assets: Their employees and data. The most common attack method that hackers exploit remains weak credentials. Passwords and tokens are flawed. That’s why Veridium has assembled an all-star team of developers and computer scientists with a singular mission: Eliminate passwords and tokens completely. Instead – your face, your fingerprints, and your voice are your credentials. Isn't it time you made the switch?